On September 2nd, Dominion Resources, along with its partners Duke Energy, Piedmont Natural Gas and AGL Resources, announced its intention to move ahead and build a major 42 inch pipeline that will stretch 550 miles across three states. It will begin in Harrison County, West Virginia and end in eastern North Carolina. Approximately 450 miles will cross Virginia entering from West Virginia through Highland County in the northwest and exiting to North Carolina through Greensville County in the southeast. A 20 inch lateral pipeline will stretch from Greensville County to the Hampton Roads area. Construction will require a temporary 125 foot right-of-way in order to dig a ten foot deep trench to lay the pipe, followed by a 75 foot permanent right-of-way. This broad scar in the landscape will cut through the Monongahela and George Washington National Forests and cross the Blue Ridge Parkway and the Appalachian Trail, cut through karst formations in the Shenandoah Valley, cross the historic James River in Nelson County as well as dozens of other smaller rivers, creeks and wetlands throughout the state. It will open up a major pathway for invasive species like Microstegium vimineum, (Japanese Stiltgrass) right across the state. Click here to see map. The project, called the Atlantic Coast Pipeline (ACP), must go through an extensive permitting process regulated by the Federal Energy Regulatory Commission (FERC). If approved, construction would begin in 2017. At a press conference announcing the project, Governor McAuliffe made a statement strongly supporting the pipeline project. He stressed the benefits for Virginia in job creation during its construction, and that will ensue from new and expanded businesses attracted by an accessible, cheap, “clean” energy source. He thinks the pipeline is very good for Virginia. The Washington Post agreed in a September 6th editorial. 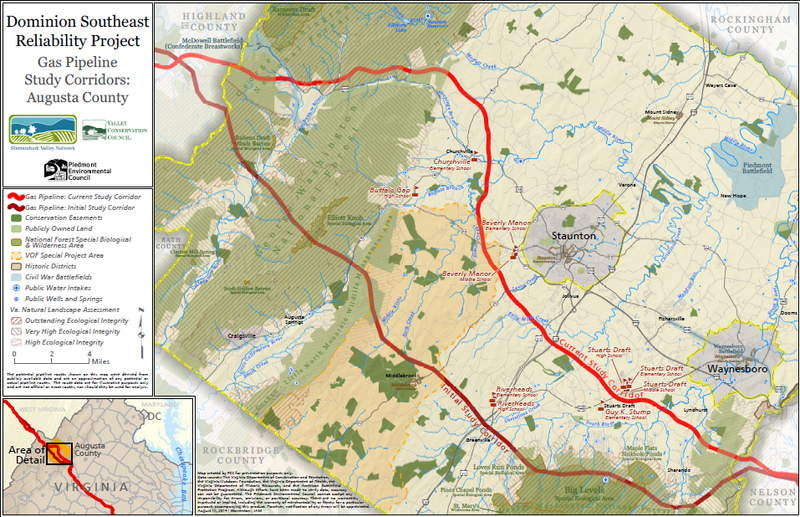 In addition to Mills Creek Springs, the Mountain Valley pipeline would run about 2.5 miles from Bald Knob-Rocky Mount conservation site and intersect many conservation easements including the North Fork Roanoke River Nature Conservancy Preserve, a cave conservancy and, once again — like the Dominion pipeline — the Blue Ridge Parkway. EQT and NextEra have not sought Governor McAuliffe’s approval yet. They too must go through FERC’s extensive permitting process before construction can commence. A local group, Citizens Preserving Floyd County, has formed to oppose this new pipeline project. In sum, these two pipeline projects propose to pass through some of the most biodiverse regions that occur in the United States. They are recognized as “hotspots” by both the Nature Conservancy and the Virginia Department of Conservation and Recreation’s Division of Natural Heritage. You can read, in depth, about the ecological significance of these regions in Gary Fleming’s Chapter on “The Nature of the Virginia Flora” in the Flora of Virginia. The danger of the pipelines goes far beyond its immediate impact on forests, habitats and personal property. Dominion and other oil and gas companies want to frack in the George Washington National Forest. To learn more about hydraulic fracking, please see my article on this on our website: Fracking in Virginia. A Texas oil and gas company already holds leases on property in multiple central Virginia counties that overlay the Taylorsville Shale Basin. If either the Atlantic Coast Pipeline, or the Mountain Valley Pipeline is built, it will increase, exponentially, the pressure from these companies on the Governor and the General Assembly to allow fracking in these areas. Fracking would cut our forests, literally, into ribbons. In addition, the Governor’s points about increased accessibility to cheap, “clean” natural gas means lateral pipelines, like the one planned to Hampton Roads, will sprout along this big trunk-line to meet the need of new and expanded businesses. Each lateral line has the potential to fragment any existing forests and other natural habitats until the state becomes a spider web of narrow, treeless, mowed areas potentially seeded with exotic grass. In mountainous areas where mowing is not feasible, maintenance to keep trees from growing into the pipes is likely to involve regular use of herbicides, probably applied aerially. File comments during the FERC environmental review process. This will entail detailed work and may cost resources since registered “interveners” must copy all participants in FERC’s environmental review process which is likely to number in the hundreds for these two projects. Hopefully, in the digital age, this will not be too onerous. VNPS could still engage in action items 2-4 above, but focus on re-seeding the right-of-ways using appropriate native plants, mowing to conserve, and banning use of herbicides except in a targeted way against invasives. OTHER – Give us your thoughts on alternative positions you feel VNPS should take. Please take a moment to let us know what you think about these pipelines by posting a comment online, or by communicating your opinion to your chapter board, or statewide representative. If for any reason you wish to make a comment privately, email info@vnps.org. The idea of this creating job cracks me up. Sure, there are plenty of jobs during the actual construction but they are not sustainable and are just raw laboring for these giant corporations and utilities. Once the pipeline is built the jobs end but if done like usual, the land is polluted and the environmental is left for the residents to deal with. Only if there is some way to stop the “business as usual” environmental damage would I support this project. Don’t even get me started about “fracking” which is already proving to be a disaster in places where it’s already been done. Who in their right mind would approve a project in their own state without being darn sure of the likely consequences? These short-sighted politicians look only to the next election so they try to claim “jobs” or “energy independence” knowing that they will be long-gone when the temporary jobs dry up and the utility is enjoying the benefits of the resources while the residents have to live in a poisonous hellhole. Tracey, you have certainly made valid points. Thank you taking the time to comment. Tell it Tracey. I can’t understand why some people are so shortsighted. This is our land, our Eden and we continue to destroy is for the god Money!! Just to let you know that VNPS can join ABRA regardless if they have taken a position against the pipeline or not. Many groups that are part of the coalition, of course, are active opponents but others have no position. I am a member of the ABRA steering committee and if you have any questions, contact Lew Freeman at ABRA. Thanks for this excellent and informative overview. Ernie, thanks for the offer, we will definitely be in touch. Thanks, Ernie. Helpful to know about ABRA. I am a member of the Jefferson chapter of the VNPS. I have to say until today I have never read the mission statement. I am reproducing it here in its entirety, as to me, it speaks perfectly to why the VNPS should OPPOSE the Atlantic Coast Pipeline. “The Virginia Native Plant Society is dedicated to the protection and preservation of the native plants of Virginia and their habitats, in order to sustain for generations to come the integrity of the Commonwealth’s rich natural heritage of ecosystems and biodiversity for purposes of enjoyment, enlightenment, sustainable use, and our own very survival. To this end, we advocate and follow practices that will conserve our natural endowment, and we discourage and combat practices that will endanger or destroy it. We are committed to do all we can to slow the accelerating conversion of natural landscape to built and planted landscape and to reduce its damage to natural ecosystems.” There is no doubt that the pipeline will permanently alter many sensitive areas that support native plants and open many areas to invasives; therefore, it is clear that VNPS should follow it’s mission and “do all we can” to stop the pipeline. More broadly, this pipeline and all others like it, as multi-billion dollar investments in fossil-fuel technology instead of in the renewables we need to use, also contribute incalculably to climate change, and its attendant damage to species and habitats. A study that just came out showed for the first time that even if there were no leaks during production or transmission (which other studies have discussed as a major issue in using fracked gas to reduce emissions), fracked gas STILL would not reduce U.S. green house gas emissions (http://news.nationalgeographic.com/news/energy/2014/09/140924-natural-gas-impact-on-emissions/). In my opinion, the effect of investing in this kind of infrastructure on the climate ALONE (given climate change’s effects on native plants and habitats) is enough of a reason for the VNPS to oppose the pipeline. Thank you. Joanna, I love your reasoning. Thank you so very much for calling attention to the correlation here. Joanna, Thank you for reading our mission statement and bringing our focus back onto protection of habitat for our under siege native plants’ habitat and communities. Best VNPS course is opposition to fracking and the proposed path of Dominion Power’s pipelines that would criss cross Virginia’s rare and protected natural areas. PRESERVING WILD PLACES, as you reminded us. Thank you, again, Joanna. Demolished natural areas cannot be restored to what they were. The “link” broken cannot be restored as it was. The pipeline route is a concern to Friends of Shenandoah Mountain because it passes through the proposed Shenandoah Mountain National Scenic Area which stretches from Rt. 250 west of Staunton to Rt. 33 west of Harrisonburg. Our proposal has been endorsed by over 200 organizations and businesses, including VNPS. The proposed National Scenic Area, which encompasses 5 national forest roadless areas, is a Nature Conservancy Biodiversity Hotspot and a Virginia Department of Natural Heritage Outstanding Ecological Core. I can’t think of a worse place to route a 42″ pipeline that requires a permanent 75′ clearing. The mature forest on Shenandoah Mountain where it would pass is relatively free of invasives. Given VNPS’s mission, it seem like opposition to the pipeline and communication of that position to FERC and the Governor would be appropriate. I think joining ABRA would also be appropriate. I think it would be most effective to oppose on the basis of the values stated in the mission statement and avoid taking a position on natural gas or energy. The main point is that this pipeline route would permanently harm some of the most special and biologicially diverse areas in Virginia. The pipeline route crosses Shenandoah Mountain on some very steep slopes. It will be very hard to mow these areas. Dominion has an electric transmission line across Shenandoah National Park, in the south section near Waynesboro. It is not well-maintained. In fact, it is a jungle of ailanthus trees. It would be hard to mitigate or restore – much better to prevent the damage. Lynn, those are points very well taken. It’s especially painful to contemplate that huge area being sprayed with herbicides. Thank you very much for your time; your thoughts will be compiled with all the others and forwarded to all the decision makers. It saddens me to think of a place such as the George Washington National Forest to be subjected to fracking. I guess I was naive enough to think that by being a “National Forest” meant it would be protected from any kind of development. I have visited Highland County many times over the years and it is the most beautiful area. There are so few of these areas left in this country now. Wildlife and our natural flora need a place to exist just as we do. We cannot keep destroying what natural habitat is left in this country. There is so little of it left now. It really does need to be preserved.I hope there will be a way for this not to happen. Cindy, I myself agree with you one hundred percent, and I’m sure that many of our VNPS members agree with imperative of preserving what little is left of our natural habitats. Thank you for taking the time to add your comment. Although a long time resident of South Carolina, I maintain my VNPS membership, and we plan to return to the area, so I have a strong interest in this issue and will oppose the pipeline, and most certainly fracking, across any federal, state and otherwise protected land. I can also describe the large power line ROW that runs through the Francis Marion National Forest, near Charleston, as a complete ecological disaster. It is a corridor for invasive plant species, its construction demolished many rare plant habitats, it is managed with mowing that has produced many deeply rutted areas, and it attracts irresponsible ATV users who have turned many a pitcher plant bog into 8′ deep mud soup holes. Jean, we certainly thank you for bringing that concrete example to our attention, although it is very sad to hear. These kinds of observations are helpful as the Society puts together its plans to address the problem, whatever form they take. We will be looking for you to come back and help us! And thanks so much for maintaining your membership; so glad to have you onboard! Looking at the Energy Information Agency’s pipeline map, there are existing interstate pipeline corridors running east out of WV to D.C. and then one running south through the middle of VA to NC. Why can’t these corridors be used instead of tearing up untrammeled beautiful areas that are on top of karst which VA geologist state are difficult to build upon? I agree that we should oppose the pipelines, and retain a position to play a key role in managing pipeline corridors, should we lose the battle. If it seems a viable and strategic tactic for the VNPS to act separately from other organizations in the campaign opposing pipelines or other developments that threaten native plants and their habitats, then I think we should do that. We should stick to the VNPS Mission and be active in preserving and protecting the natural values we all cherish. I’m very proud to be a part of that mission, and I commend the people who drafted it. With the VNPS having developed sufficient clout to be in a position of credibility about native plants and their habitats to legislators, the Governor, and other key people, we should be a loud voice in opposing developments which threaten to degrade or destroy the natural values of which our members have specialized knowledge. In order for us to sustain a position of credibility and pertinent expertise, we should stay on-topic in regard to native plants, their habitats, and closely related topics in our campaign, and not venture into territory about which we may not be perceived as having expertise. By that I mean that the VNPS should not go into topics such as the arguments about job creation, carbon fuels and global warming, the development of alternative energy sources, fracking, groundwater contamination, surface water contamination, etc., etc.,…this is where we will likely lose credibility to our audience because this is not the territory of discussion where the VNPS will be perceived as having expertise. I’m sure that many of our members are indeed experts in these topics, but while representing the VNPS, we should leave discussions of those topics to the Sierra Club and the other environmental heavyweights or specialists on those topics. The opposition and legislators have heard plenty of that talk anyway. But perhaps they haven’t heard all we would like for them to hear about endangered plant species, invasive alien plants, forest fragmentation, herbicide use, etc. When we come to the table, these people will be expecting the “wildflower people” to talk about wildflowers. Let’s surprise them about how much trouble they could get into with a pipeline when we talk about endangered species habitat and how they would have to mitigate its loss. Mitigation in some cases may be impossible where unique or rare habitat types are damaged or destroyed. An EIS could reveal previously unknown populations on public land. Let’s discuss the costs of maintaining a corridor while controlling invasive plants in perpetuity. These are topics about which we will be perceived as being the experts. Cost is the bottom line for the opposition. They will back away from slashing a corridor through habitat we value if they believe that management costs will be excessive where a pipeline would cross public land and private land that can be purchased on the cheap. Perhaps we could be persuasive. I think many of us realize that a pipeline corridor cannot be maintained invasive-free. Inevitably, alien plants will become established and spread into surrounding land, no matter how sincere the efforts of the managers may be. And we can count on corporate employees or most private contractors being less than driven in that cause. If we do succeed in securing an agreement for invasives control and other management or restrictions, who will police the corridors to verify that management has been done according to agreement? Will the VNPS be in a position to sue if not? Regulations are of value only if they can be enforced. Hopefully we will not have to be concerned about all that. With sufficient numbers of constituents voicing their opposition, our elected officials will be swayed from this potential disaster. Posting links in our newsletter to direct members directly to them for entering their personal comments will facilitate that cause. Let’s show them that we are going to stand up to defend what we value! Dan, those are excellent points. I will make certain the whole board receives a copy of your remarks; thank you so much for your loyalty to our Society and our causes. I love this whole summary and intelligent discourse. Does anyone know of a similar organization working on the human health impacts, specifically of living near pipelines in the US, but more broadly perhaps of fracking? I have some expertise in public health, in reading studies, and I am currently in a graduate nursing policy class. I have permission to do pipeline health research as my project, but only a limited time frame (one more month) when I have access to certain scientific/scholarly databases. Thanks. ERNIE REED, you out there? I agree the VNPS should oppose the pipeline. The George Washington National Forest and other forested areas in Virginia that fall along the Appalachian chain are home to native plant species such as American ginseng, black cohosh, bloodroot, and goldenseal. These important species are a source of income and medicine for many rural communities in Appalachia. These plants are harvested by local communities (sometimes to help buy a pair of shoes) and sold for a pittance to raw materials dealers who turn around sell these native species at great profits to become incorporated into dietary supplements and other foods. I work to conserve these plants by encouraging the sustainable use of these species. These plants rely on the forests in which they live, and cutting into these woods does more to destroy the plant populations than most harvesters could do in a lifetime. It’s hard to tell someone who’s trying to make money to buy shoes not to harvest a plant when they see the forest being cut down all around them. Stop the habitat destruction NOW!